It’s been a bumpy road, getting from there to here, it’s been a long time, but my time is finally near. And I can feel the patches in the wind right now, nothing’s in my way. The crashes are not going hold me down any more, no they’re not going to change my mind. Because I’ve got faith in Gamindustri. I’m going where my Neptune will take me. I’ve got faith to believe I can do anything. I’ve got the strength of the Shares and no bugs are going to bend or break me. Tell me, has this ever happened to you? One day while walking down the street minding your own business, you suddenly hear someone cry out for help. Of course being the Good Samaritan that you are, you rush instantly to the location where you thought you heard the voice coming from. Oddly, you see no one there; however, your heroic efforts were not in vain. With great delight you notice a strange game console lying on the ground just waiting for you to pick it up as a reward for your altruistic endeavor. You take it home, trustingly hook it up and suddenly get sucked into another dimension…. Dang it, that’s the third time that happened this week! It’s time to stock up on copious amounts of pudding and banish all the eggplants as we enter the multiple dimension spanning Megadimension Neptunia VIIR! 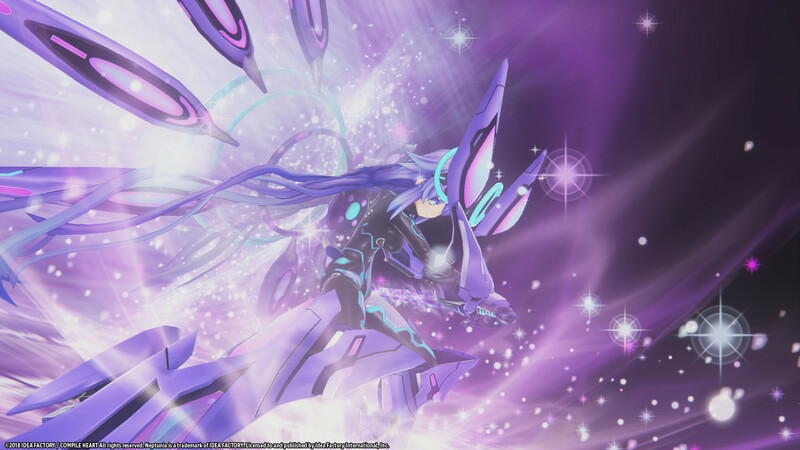 Megadimension Neptunia VIIR is the VR enabled version of Megadimension Neptunia VII which is otherwise known as Megadimension Neptunia Victory 2. 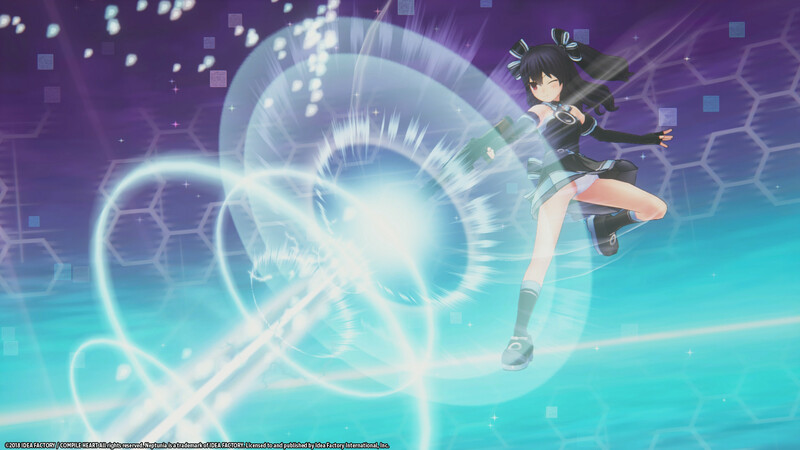 It is the name of the seventh game in the Neptunia franchise as well as the sequel to Hyperdimension Neptunia Victory (on consoles) otherwise known as Hyperdimension Neptunia Re;Birth3 V Generation on Steam. The name Megadimension Neptunia VII is rather clever in that regard with the VII serving the dual purpose of both seven and V 2. Despite being a sequel to Hyperdimension Victory it still makes a good starting point for any newcomers to the series. While you will miss out on the nods to the previous games, and you won’t get some of the name drops or references, the game does an excellent job reminding everyone who people are and what things or items are so that you can easily follow along and enjoy the epic length story. The game itself is sectioned into three acts with each act having its own title screen and opening video which is a really nice touch and treat for the fans. If you have never seen a Neptunia opening video, head on over to the Steam Store page where you can see the main opening video for Megadimension Neptunia VIIR. They are always enjoyable to watch even if I can’t understand the lyrics (what with not being able to understand Japanese). Not being one to spoil games, I won’t go into story details, but I can say that the first part sets you up to get a good feel for the basic gameplay before the second part adds a ton of extra features and also a nifty multi-perspective story arc too. The third combines everything into an epilogue for the trilogy. For those of you completely new to the series and the world of Neptunia, it is a hybrid turn-based JRPG and Visual Novel-esque game. While you don’t really make any choices as you go, other than perhaps which path you want to take, the game progresses in a linear fashion. The story elements are told with a mixture of fully voice acted and dialogue on screen style text boxes. The majority of the time the characters in a scene appear as static images on the screen with facial expressions changing to suit the mood of the character. There are a few full-motion videos mixed in, but they are not common. Let’s talk about the Neptunia-verse for a bit. 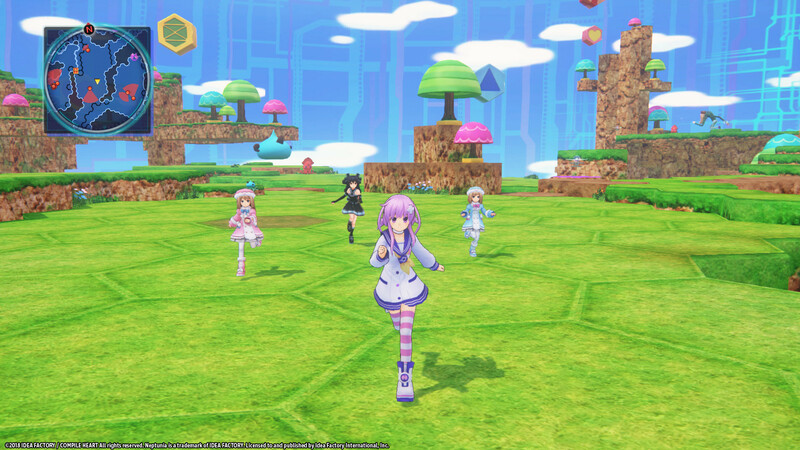 For those completely unaware, the Neptunia series is set in Gamindustri in the Hyperdimension for the most part. Gamindustri is divided into four factions based on real life video game consoles: Planeptune (Sega Neptune), Lastation (Sony PlayStation), Lowee (Nintendo Wii), and Leanbox (Microsoft Xbox). 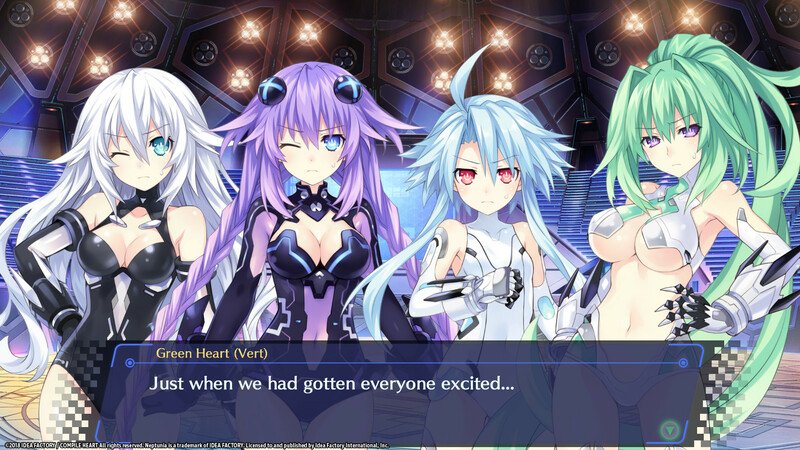 Each one of those factions is protected and ruled over by a CPU (Console Patron Unit): Neptune (Goddess Purple Heart), Noire (Goddess Black Heart), Blanc (Goddess White Heart), and Vert (Goddess Green Heart). If playing Massive Multiplayer games have taught me anything, the armor the CPUs wear when transformed into Goddesses must be very high level gear, especially for Vert! There are also CPU Candidates based on real life handheld game systems as well. Besides the CPUs and CPU Candidates there is generally an assortment of regular non-transforming characters available to help you. You can either use them to fight alongside you, or use them as support characters, switching them in to offer aid to the main team or just their general offensive or defensive passive support. 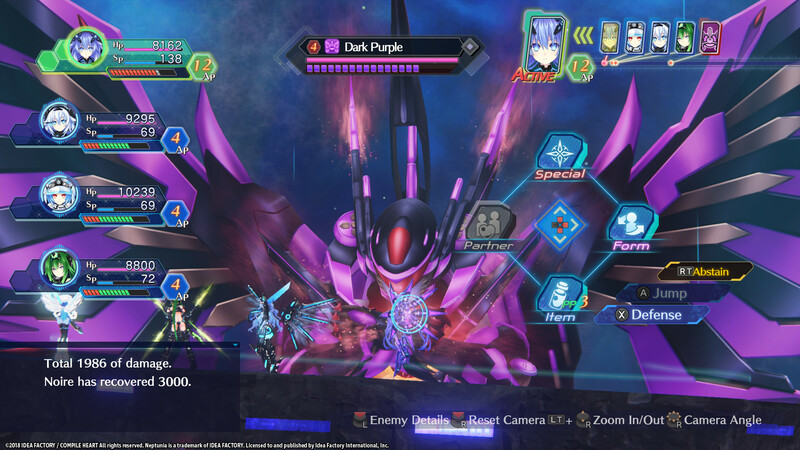 The gameplay in Megadimension Neptunia VIIR involves a team of up to four (optionally supported with an additional team of up to four waiting on the sidelines) doing quests as they explore the area they are in. When in a dungeon, you can see the monsters/enemies roaming around which gives you the option to either fight them or try to sneak past them. If an enemy spots you, it will charge at you causing you to enter combat even if you didn’t want to. If you are planning on getting into a fight all you need to do is come in contact with the monster to be taken to the battlefield. If you would prefer to have an advantage, you can try to swing your weapon and connect that with the enemy causing you to get a preemptive “Symbol” strike. On your turn you can wander around within your movement range and then attack anything that falls inside your rotatable hitbox. There are abilities you can use, there are team combos to launch, items and even transformations to help you get through even the most challenging battle. They say that the combat in Megadimension Neptunia VIIR is an improvement over VII, but I think it was really just simplified. That’s not a bad thing, and I’m not completely sure which system was best at this point, but it definitely made the game feel different. One thing that was retained though was the fact that even their transformations have transformations now! 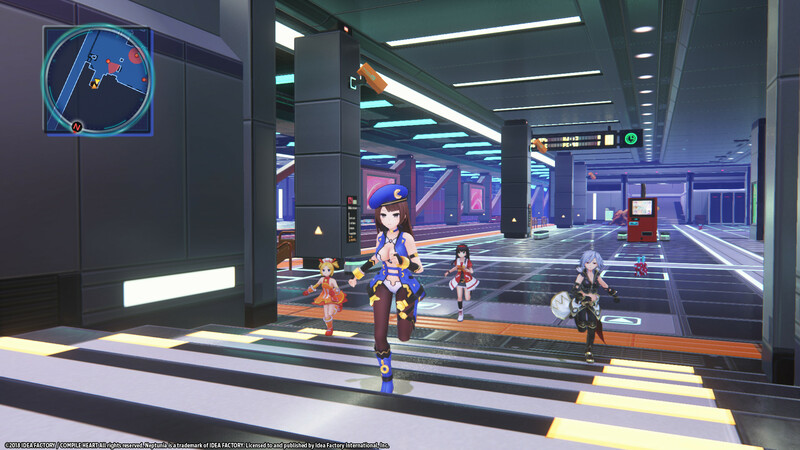 Besides the Next Gen Form, there are a few new features added to Megadimension Neptunia VII and Megadimension Neptunia VIIR that were not present in the previous entries. Neplunker, which pays homage to Spelunker, changes up the core gameplay. There is now a timer element and instant death mechanic in play while visiting a Neplunker dungeon. Instead of being safe when standing on a precipice, one wrong move will get you killed. Coming in contact with most things will also kill you. If you get into combat, it won’t kill you directly, but it will sap some of your energy. Making it to the end will get you a powerful reward making the effort worth it. Another new feature is parts breaking. Some enemies will now have breakable parts. If you choose to do so, you can focus your attacks on the side that has the breakable part rather than just worrying about killing the monster. Breaking the part will make the enemy more vulnerable. Another new feature is the pocket dimension that is sometimes used. 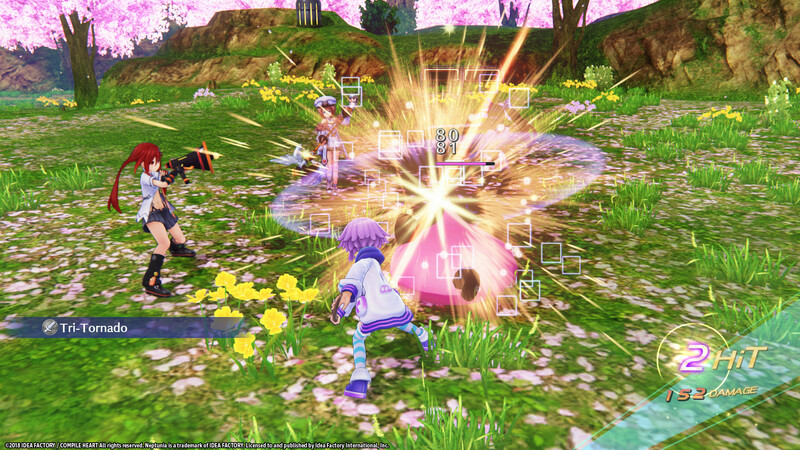 Uzume can use her special power to create a Sharing Field. Inside the Sharing Field you can battle giant enemies. You don’t have access to your melee ranged attacks or abilities. Hopping from platform to platform allows you to spread your team out in order to more easily trigger formation attacks as well as make it harder to be wiped out. It also makes it harder to revive your fallen companions so you really need to figure out what strategy will work best for you. Character customization has always been a strong point in the Neptunia series. I remember back in the day when equipping new weapons and armor in a game made no difference to the appearance of the characters in the game. Then one day someone came along with the idea of palette swapping so you could tell something different was equipped which paved the way for weapons and armor actually changing in appearance! Well in the Neptunia series, new weapons actually look different, often extremely different than the weapon the character was previously equipped with. While armor isn’t really noticeable outside of CPU form, clothing can be changed to suit your tastes. Besides the cosmetic changes some of them actually will increase your stats a little as well. The only real drawback here is that in story-based scenes, the characters still wear their default outfits. This is obviously done because the characters are drawn and not rendered on the fly so drawing every single outfit combination would be impossible. When using skills in battle, the character wears the outfit you have equipped her with. I never like spoiling a story for a game, but I do have to talk about the story a little here. I need to tell you the reason why this game is called Megadimension and not just Hyperdimension like many of the previous games are set in. This game actually spans four separate dimensions. The first act, as mentioned earlier, serves as an excellent introduction to the gameplay and shows off all the basic mechanics for the game. It takes place in the Zero Dimension, which is a kind of post-apocalyptic world devoid of human life. The second act takes place in the series familiar Hyper Dimension and gives you a “Choose Your Own Adventure” style choice system. You can basically pick which of the four stories you want to play first, second, third and last. All the stories take place at roughly the same time so there is some information bleed over that occurs between them which some might consider spoiling events of that other yet to be played option. It makes it a nice touch because it keeps the worlds from seeming completely isolated from each other while at the same time allows the game to play out four whole story arcs simultaneously. The final act of the trilogy ties together the first two acts and adds the Heart Dimension and carries you on to the ending. The final dimension is new to Megadimension Neptunia VIIR, but more on that later. There are a few common elements shared between all the Hyperdimension games. Other than the characters, which should, of course, carry over if the series is meant as a continuation of the previous games as is the intention here, but also the enemies carry over as well. It makes perfect sense that the same enemies will be battled in each of the games as they are all set in the same location, the Hyperdimension. New enemies naturally pop up in each new installment of the game, but the familiar ones are very welcome as well including the series long running villain Arbore, I mean Arfoire (Deity of Sin). The enemies are all voiced in Megadimension Neptunia VIIR as well, and their dialogue changes based on how well they are doing in battle. The dialogue gets a bit repetitive if you are grinding the same enemy types, but I really liked the fact that battles were not just silent slap fests between your characters and the enemies. Another element that is shared between the games are the dungeon layouts. While this makes sense, again same dimension, it is a little unfortunate that the exact same layouts of dungeons are reused so often between games and within the game itself. Speaking of common elements, one thing that the Neptunia series is known for is its references and nods to other games and developers. The Gold Third are introduced as unwitting villains and each one represents a major game company. Spoiler Warning! As an example S-Sha representing the company Square (known best for the Final Fantasy series). S-Sha was critically wounded while making a film and E-Sha, who was her rival saved her life by merging their souls into E-Sha’s body. E-Sha represents Enix (best known for Dragon Warrior/Quest a rival game to Final Fantasy). When Square made the first Final Fantasy movie it nearly bankrupted them, but Enix came in and saved them by reforming the company as Square-Enix. Since Square is still the more dominate company, S-Sha has the more dominant personality with E-Sha only appearing occasionally. 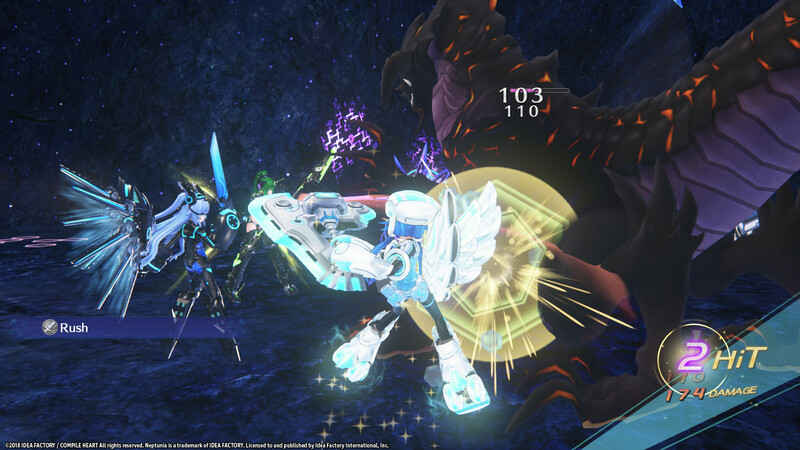 Overall, S-Sha’s appearance and dialogue play homage to the Square-Enix’s games, including her singing the Final Fantasy level up sound occasionally when she levels up and her one-winged angel form. 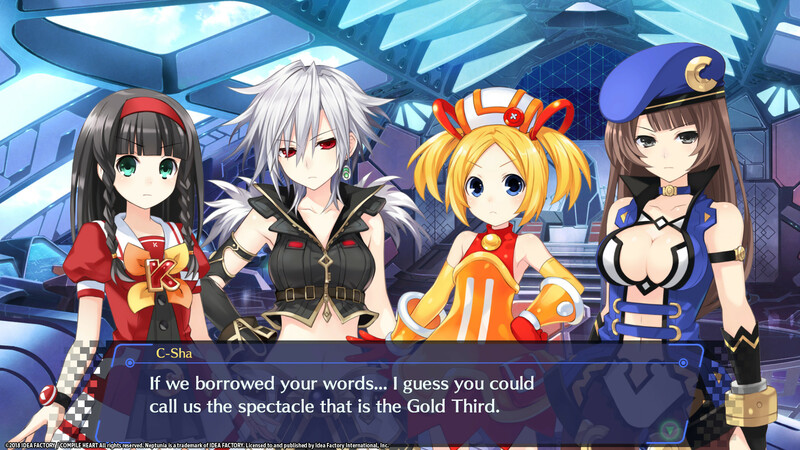 That’s not the only reference of course; part of the fun of playing a Neptunia game is trying to figure them all out. Sometimes it is the level style, such as the Player 2 Park located in Lowee. Player 2 Park plays homage to the Super Mario Brothers series. The entire level feels like it could be out of one of the 3D Mario games. Except this time, the pipes are trying to kill you rather than letting you warp around! 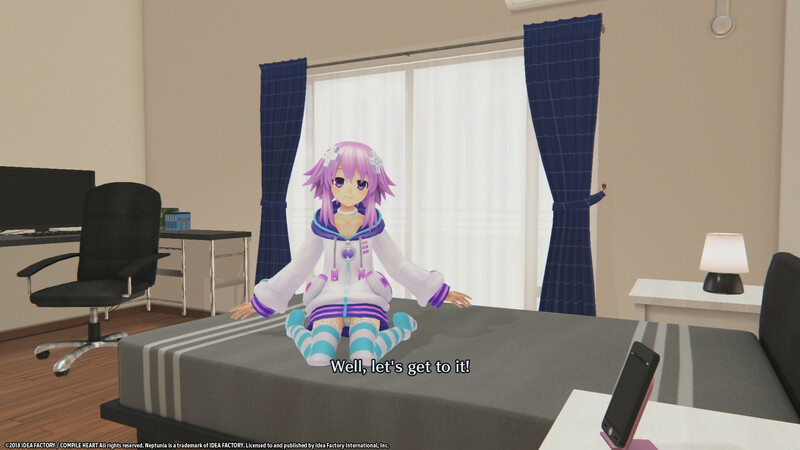 Neptune, the series protagonist, herself constantly breaks the fourth wall with metacommentary. This is a rather fun twist this series offers. 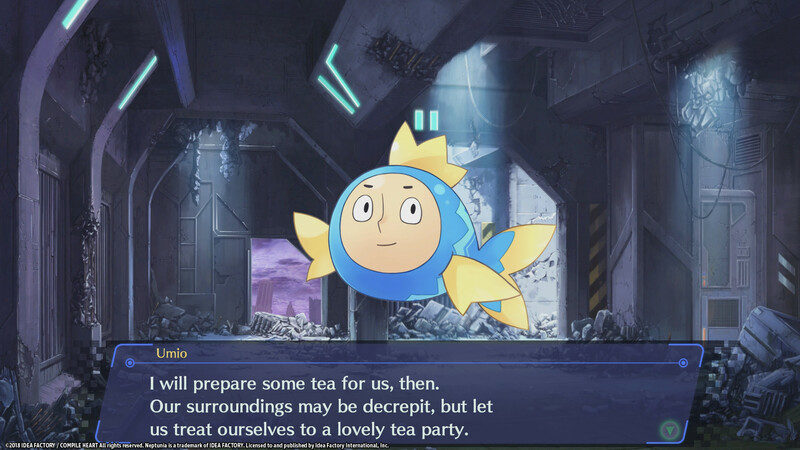 Rather than taking the game seriously, and keeping all dialogue strictly related to the story, Neptune often makes comments that makes her seem to know she is just a character in a game, rather than on a serious mission. She also likes to tease her friends and generally is bad at getting people’s names right. The character development in this game is well done. Playing the entire series truly lets you get to know the characters. Each one of the main characters (CPUs) and their younger sisters (CPU Candidates) each have their own well-defined character traits. 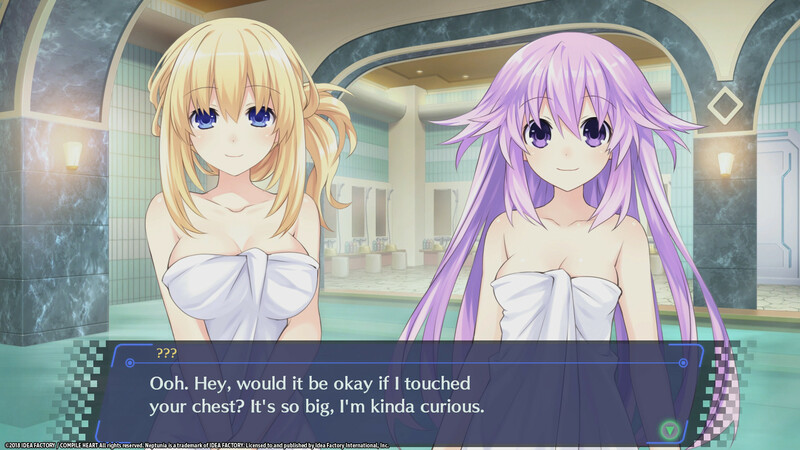 Be it Neptune’s laziness, serious obsession with pudding and aversion to eggplants or Blanc feeling inadequate when standing next to Vert, each one of them feels like a real person you have come to know across all the games. This isn’t really a game series you pick up just for the gameplay, it’s a game for people who really enjoy a rich story (that isn’t entirely serious) and character development. The bulk of the game is actually story itself, much like a Visual Novel. To break up the story, you go off to hunt some monsters in a dungeon, before plunging right back into the story and optional story elements. Even main story dungeons themselves break out into dialogue events as you explore the dungeons. This is truly a game meant for those who enjoy story! Oh, right before getting to the verdict, I probably should mention the last major change that Megadimension Neptunia VIIR has to offer. The VR, virtual reality segments. If you are lucky enough to own a system strong enough to play VR games and have a VR headset then you get to have a little personal time with the various characters in Megadimension Neptunia VIIR. You have your room, which you can customize with things that you unlock through your interactions with the characters, such as plushies of the character themselves. When in your room, the characters will visit your dimension, the fourth dimension I eluded to earlier. Generally, the character will interact with your room and talk to you about whatever they have on their mind or steal your sweets or do other things as if they were really visiting you. If you are not fortunate enough to own a VR headset, you can still view these segments in normal view, but it likely lacks a little of the flair and fun of the VR experience. These segments don’t really do much other than give you an excuse to use your VR headset or take you out of the action for a little while. So, should you get it? If you are fan of the Hyperdimension main series, you would be doing yourself a disservice by not picking it up. It is the fourth game in the main series after all. The gameplay is basically similar to its predecessors, at least the Re;Birth incarnations, but it has a whole new story with new and returning familiar characters. If you are new to the series, you might want to start with Re;Birth2 (story arc start) or at least Re;Birth3 so you will be able to get the references back to the previous games. Regardless of your choice, Neptune does a good job filling the player in with the details of who each of the returning characters are and what they are all about. Any references to the previous games can be chocked up to lore in other games, where they talk about happenings that “took place” before the game started. Megadimension Neptunia VIIR will still make a great entry point into the series as would Megadimension Neptunia VII which was probably one of the best Neptunia games to date. 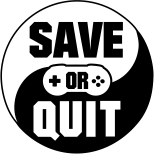 If you are the kind of person who skips dialogue and wants to just get straight to the gameplay, you might find the game will be over fairly quickly. 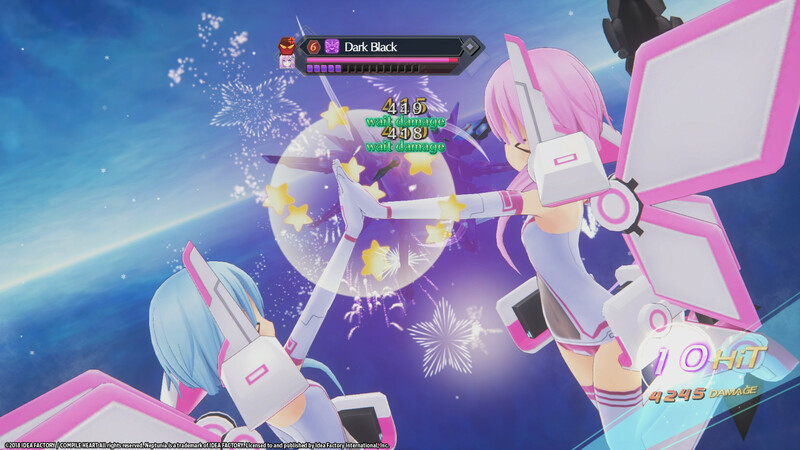 If you love story driven games Megadimension Neptunia VIIR can really grab on and hold your interest. I would say continue the story and pick this one up now!